Found in similar warm, green environments, praying mantises and walking sticks are different types of insects. Walking sticks are also called stick insects, and praying mantises are also known as praying mantid. Although they usually come in similar colors and sometimes live in the same garden, there are striking differences between these two species. They have completely different needs and instincts when it comes to feeding, mating, raising young and surviving. Walking sticks hide easily among grass and plants. Stick insects lay eggs. Their young are born appearing like a tiny adult of their species. They climb up the plant that their egg was on, and begin eating the leaves. For months, stick insects molt and grow, until they reach adult size. Praying mantis females are larger than males, and sometimes cannibalize their mate after breeding. Females may lay up to 400 eggs, which hatch once spring arrives. Newly hatched mantises may cannibalize each other. Both walking sticks and praying mantises use camouflageto hide from predators and blend into their environments. 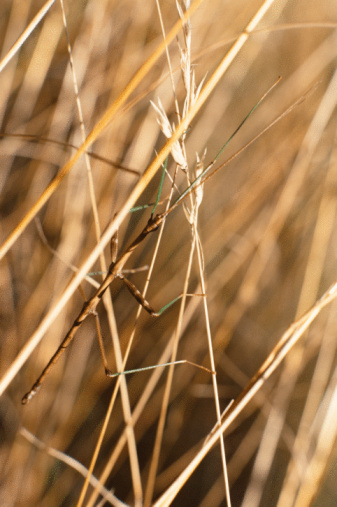 Walking sticks are sometimes able to mimic the colors of their surroundings to better blend in. Their shape mimics the appearance of a dead stick, which they use to hide in their environment. Praying mantises often are colored similarly to the plants in their environment. Some mantises from the Far East mimic the colors of flowers. Walking sticks eat only leaves and plant life. They can feed on the very leaves and plants that allow them to blend in and hide from predators. Praying mantises are carniverous. They live off of and eat other insects. The praying mantis hunts by grabbing passing insects with its sharp forearms, biting it, and eating it while it is still alive. Some praying mantises are able to hunt mice and small birds. Walking sticks are sometimes kept as pets in a jar or terrarium. Although they are fascinating to watch, this may have a negative impact on the environment. Unlike some insects, walking sticks are usually seen in a positive light by most people. Praying mantises are carnivorous and eat other bugs, so many people enjoy having them around. In China, praying mantis are considered good luck and are kept in the home, and given as gifts. Why Do I Have Dragonflies Swarming Around My House?